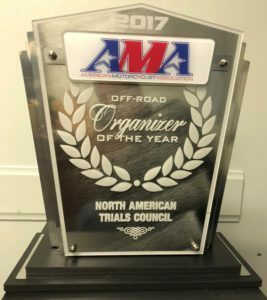 The TTC’s Dan Brown and Charlie Roberts received this email from their colleague Brad Baumert yesterday, informing them that the North American Trials Council (NATC) was awarded AMA’s 2017 Off-Road Organizer of the Year at the AMA banquet over the weekend. Dan and Charlie are on the NATC council with Brad. Over the weekend I attended the AMA Champions Award Banquet, the 65 Trials riders and enthusiast that filled 7 tables at the banquet included 6 time National Champion Ryan Young, our 2017 Champion Pat Smage, 2017 World Trials round winner Kylee Sweeten, 2017 Expert Champion Alex Myers and many other champions from our series and Vintage trials. 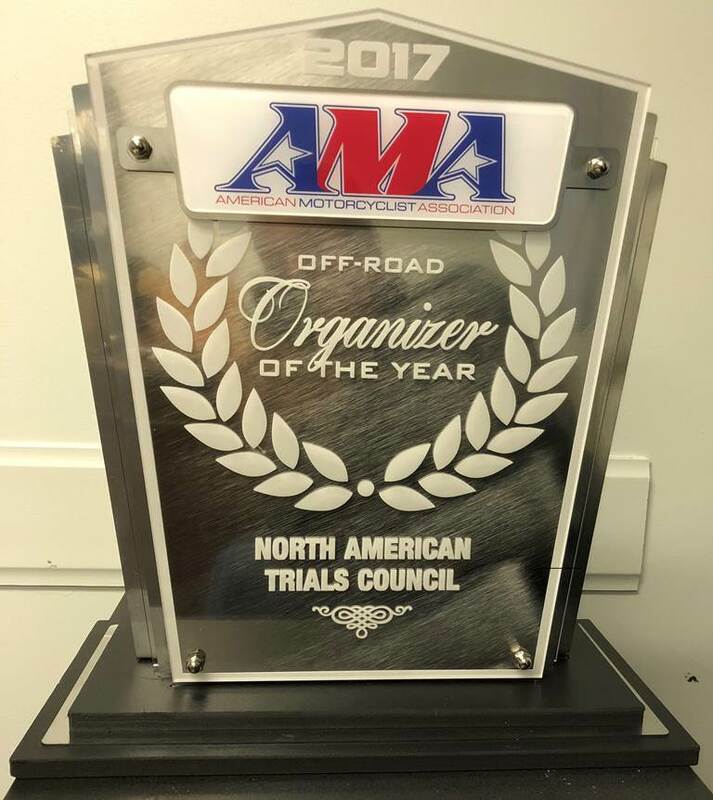 I am pleased and honored to let you know that in front of the over 900 in attendance, the NATC was selected as the 2017 Off-Road Organizer of the Year. We were up against some heavy competition as the other nominees were, National Enduro Promotions Group (NEPG) and Racer Productions (GNCC). 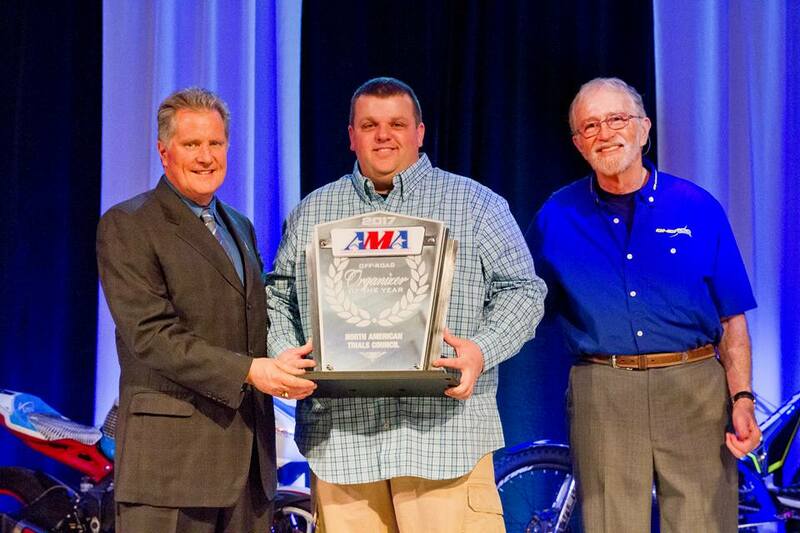 I was totally caught off guard but had Adam Blumhorst and Jerry Young accompany me on stage to accept the award. Everyone who takes part in the NATC has contributed to the success we have attained. The 45 years of work that some of the current council members have dedicated to this sport are responsible in great part to bringing us to this point. I was humbled to be the one to accept the award, and would like to thank each and everyone one of you for your tireless support. The staff that has “boots on the ground” at the events, Scoring Steward-Vonda Roper, Sporting Stewards-Stan Hensley and Jim Fox, Carolyn Saum who keeps us all going in the right direction, Howard Galbreth who somehow pulls off the impossible with all our printing and communications needs and Phil Baumert with his series software and support are all invaluable. The Board of Directors who keep the “Big Picture” in sight, and all the council members, club reps, rider reps, manufacturer reps, and just plain enthusiast who keep everything fresh and interesting with ideas, suggestions and challenges, can accept ownership of this award. I wish each and every one of you could have been there to accept, it was definitely a great night for our sport! 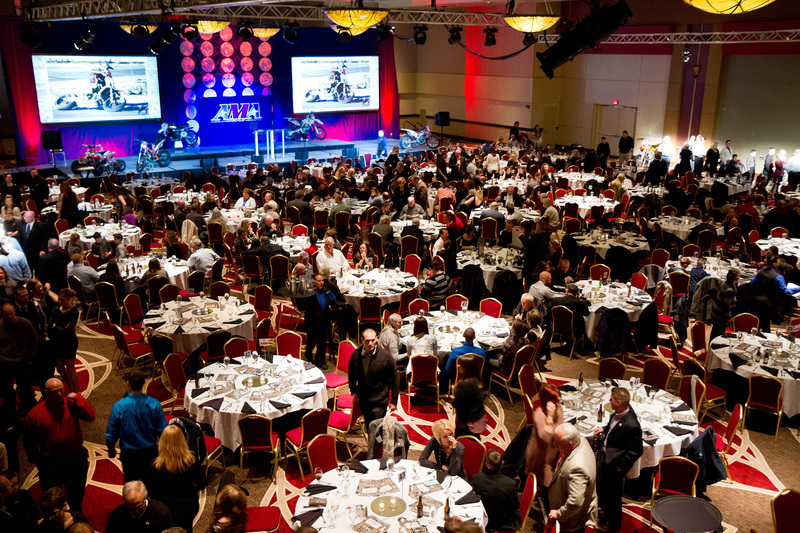 On another note, Cody Webb won AMA Athlete of the Year, during his acceptance, he talked about the influence trials had on his success and it seemed like the whole room was looking our way….another great moment for trials. Thanks again for everyone’s help and support in all areas. Remember success is a journey, not a destination…..so let’s keep it up!